The Plesso Vespignani is a prestigious historical building that was recently renovated for the university, and is now the University of Bologna's main teaching facility in Imola. The Plesso Vespignani is a prestigious historical building that was recently renovated for the university with the generous contribution of the Cassa di Risparmio of Imola Foundation, and is now the University of Bologna's main teaching facility in Imola. The building hosts classrooms and study rooms for teachers as well as a computer laboratory, study halls and a library; the teaching activities performed here for the Schools of Agriculture and Veterinary Medicine, Pharmacy, Biotechnology and Sport Science, Medicine. All the facilities at the Plesso Vespignani have disabled access. The Almawifi wireless network also covers the Plesso Vespignani. The network is available for all teachers and students with an active University account. For more information on Almawifi. The notice boards in the building provide information to help find accommodation in Imola and for meal discounts. For information on the city of Imola and its services, see the website of the Municipality. - Arriving by car, find the route on Google Maps. - Arriving by bus: line 101 Bologna/Imola/Bologna – from the bus station follow the signs to the Centre and the University – Palazzo Vespignani. 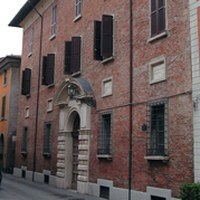 - Arriving by train: from Imola railway station follow the signs to the Centre and the University – Palazzo Vespignani. See the train timetables. From 29 March the study room in Piazza Duomo 9 will be closed for works. P. Vespignani and all other premises of the University of Bologna in Imola will be closed during Easter holidays from 18 April until 23 April 2019.